Minnesota is 11-1 at home this season under first-year coach Richard Pitino, but the Gophers have struggled late in close games against top opponents, losing conference contests to Michigan and Michigan State. The annual Wisconsin-Minnesota two-game basketball rivalry begins anew at 8 p.m. Wednesday in Williams Arena. It will bring the usually high levels of intensity and importance. And this season, it will feature two teams in desperate need of a victory to stay afloat in the Big Ten early during the conference season. No. 9 Wisconsin (16-2, 3-2 Big Ten) has lost two consecutive conference games following the best start in school history. Minnesota (14-5, 3-3) is coming off a road loss to Iowa, and neither the Badgers nor the Gophers can afford to slide into the middle of the Big Ten pack. Minnesota is 11-1 at home this season under first-year coach Richard Pitino and has the weapons to knock off a top-10 team Wednesday. So which team has the advantage? Fox Sports North’s Gophers writer Tyler Mason and Fox Sports Wisconsin’s Badgers writer Jesse Temple cover these teams and offer their take on the game in a five-question point-counterpoint. 1. In what ways has the team you cover exceeded preseason expectations? MASON: Few people gave the Gophers a chance to compete in the Big Ten this year. 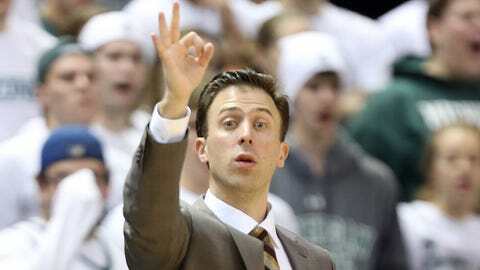 They have a new head coach in Richard Pitino, who had just one year of head coaching experience prior to this season. And there were question marks on the roster, including Minnesota’s perceived lack of a post presence. But this Gophers squad has exceeded many peoples’ expectations so far and has been competitive in nearly every Big Ten game — with the exception of Sunday’s 21-point loss at Iowa. Pitino has shown some chops as a young coach, as his up-tempo style of play has worked even in the grind-it-out mentality of the Big Ten. Minnesota’s big men, Elliott Eliason and Mo Walker, have been better than expected. So, too, have newcomers DeAndre Mathieu, Malik Smith and Joey King, all of whom were part of Pitino’s first recruiting class. Outside of Andre Hollins and Austin Hollins, it didn’t appear as if Minnesota had many scoring options entering the year. But Mathieu, Smith and King have all shown a knack for scoring the basketball, too. The result of all of this has been a 14-5 record heading into Wednesday’s game against rival Wisconsin. TEMPLE: Most college basketball junkies thought Wisconsin would be a good team — when have the Badgers been bad under Bo Ryan? But the consistency with which the team has scored points has been something we simply don’t see every year. Consider that Wisconsin is averaging 75.8 points per game, which is the best mark in 19 years. It’s also a 10.8-point increase over last season. UW has scored at least 70 points in nine straight games. The last time that happened was the 1992-93 season. The reason for the increased scoring is that the starting lineup of Traevon Jackson, Ben Brust, Josh Gasser, Sam Dekker and Frank Kaminsky are all offensive weapons on the floor. Every starter but Gasser is averaging double figures in scoring. The Badgers share the ball exceptionally well and average 1.22 points per possession — also the best mark in the Ryan era. 2. What area does your team need to improve to make a postseason run? MASON: The Gophers need to get better at closing out close games in order to not only make the NCAA tournament but to also have any chance of winning a tournament game. This is something that plagued Minnesota in its first Big Ten game as the Gophers couldn’t close out visiting Michigan and lost 63-60. The same thing happened nine days later in East Lansing, Mich., when Minnesota let a late lead slip away against Michigan State. The Spartans forced overtime, and the Gophers simply couldn’t do anything in the extra session, falling 87-75. Minnesota did close out a tight game at Penn State and escaped with a win, but those losses to Michigan State and Michigan still linger. Most games in the Big Ten will be tightly contested and could likely come down to the wire. The same goes for any potential tournament games. Minnesota needs to improve defensively in late-game situations in order to become a legitimate tournament team. TEMPLE: Few are the seasons in which you question Wisconsin’s defensive execution, but the Badgers have given reason to make some wonder this year. Last week’s losses to Indiana and Michigan may have revealed a couple of weaknesses that are tough to mask. Wisconsin surrendered a season-high 52 points in the paint during a 75-72 loss at Indiana last Tuesday. On Saturday, the Badgers couldn’t contain Michigan’s jump shooters off of on-ball screens, and it bit UW in a 77-70 loss. Overall, Wisconsin is still second in the Big Ten in scoring defense (62.8 points per game), but Bo Ryan knows this team has a long way to go to match the execution of previous Badgers teams. Last year’s senior-laden frontcourt of Ryan Evans, Mike Bruesewitz and Jared Berggren is gone, and the trio’s collective absence is proving tough to replace on defense. 3. Wisconsin does not allow teams to shoot many 3-pointers (14.4 per game, ranking 21st in the nation in fewest allowed). Minnesota likes to shoot from downtown (21.8 per game, ranking tied for 47th in the nation): Who wins this battle and how important will it be in determining the victor? MASON: The Gophers have lived and died by the 3-pointer in many games this year. Minnesota hit 10 shots from downtown in an overtime loss to Michigan State, but struggled from beyond the arc in its next two games. Pitino’s team was just 3-for-14 from 3-point range against Ohio State and hit only 5 of 16 attempts from long range in the loss to Iowa. Given Minnesota’s streaky nature — and the fact that the Gophers have hit just 31.4 percent of their 3-pointers — it could be a tough task from long range against a Badgers team that doesn’t give up many shots from beyond the arc. Wisconsin may have the slight edge in that battle, meaning Minnesota will have to find other ways to score instead of relying on the 3-pointer. TEMPLE: One of Wisconsin’s primary defensive concerns under Ryan has been to take away 3-pointers and shots at the rim. That was part of the plan against Michigan, too, but the Wolverines simply made too many 2-point jumpers. Opponents this season have made 83 of 260 3-pointers (31.9 percent), which ranks No. 82 in the country. And while Minnesota takes a lot of 3-pointers, the Gophers are hitting just 34.4 percent of attempts, which ranks No. 153. Compare that to Wisconsin hitting 39.2 percent of 3-pointers (No. 33 in the country), and the Gophers’ advantage doesn’t really seem to exist. For those reasons, Wisconsin should win this battle. 4. Which player has to have the biggest game for the team you cover to win? MASON: Senior Austin Hollins needs to step up in this one. Throughout the season, the Gophers have gone as Hollins has gone. While he’s been their second-leading scorer (11.8 ppg), he has had too many off nights offensively already this year. During a stretch of games against Penn State, Michigan State and Ohio State, Hollins scored just four, seven and six points, respectively. Hollins has struggled against Wisconsin in the past, too. He had just two points on 1-of-10 shooting in last year’s 45-44 loss to the Badgers in Madison. 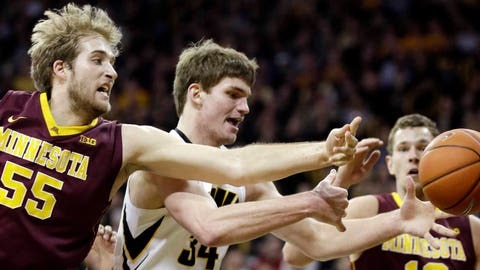 Hollins was also held to two points in a Gophers loss against Wisconsin during his sophomore season. Wednesday’s matchup might turn into an up-tempo game, and Hollins has thrived in transition this year. Defensively, he could be tasked with guarding Badgers star Sam Dekker, Wisconsin’s leading scorer. As much as Minnesota will need offensive contributions from Hollins, the Gophers will also rely on his lockdown defense on the perimeter. TEMPLE: The success of this team is not predicated strictly on one player, which is the beauty of the Badgers this season. But if we’re going to pick somebody, sophomore forward Sam Dekker is an easy choice. He’s still the team’s leading scorer (13.8 points per game) and leading rebounder (6.3) and can play anywhere on the court. Dekker scored eight points in the first seven minutes against Michigan and appeared headed for a big game. But he scored only two points the rest of the way, and the Badgers couldn’t overcome a double-digit second-half deficit. Dekker needs to be more assertive and show why some consider him to be a potential NBA lottery pick down the road. He can score inside and out and is a difficult matchup for most teams to handle as a stretch forward. 5. Which team is going to win this game, and by how many points? MASON: Coming into the Big Ten season, I would have said Wisconsin wins this game. The Badgers looked to be the best team in the conference and didn’t have a single blemish on their record. 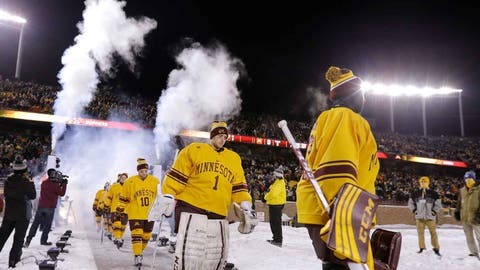 The Gophers, meanwhile, were relatively untested in nonconference play. I wasn’t sure how they would stack up in the Big Ten. But now that both teams have played several conference games, my opinion is changing. Wisconsin has shown it’s not invincible, and Minnesota has proven it can hang with the best teams in the Big Ten. I’m predicting the Gophers win this one at home, although it’ll be a close one: 73-70 Minnesota. TEMPLE: This is a tough game to predict because Minnesota plays so well at home. But Wisconsin has only had five three-game losing streaks over the past 12 seasons with Bo Ryan in charge. Plus, this is a team that only last week was considered a legitimate Final Four contender, with victories over five teams in the RPI top-50. Given what we’ve seen from both teams, the game could wind up as an unusually high-scoring affair, but the Badgers have proven they can play at that pace. Wisconsin 77, Minnesota 72.